Need more information about booking Home 8815521 ? 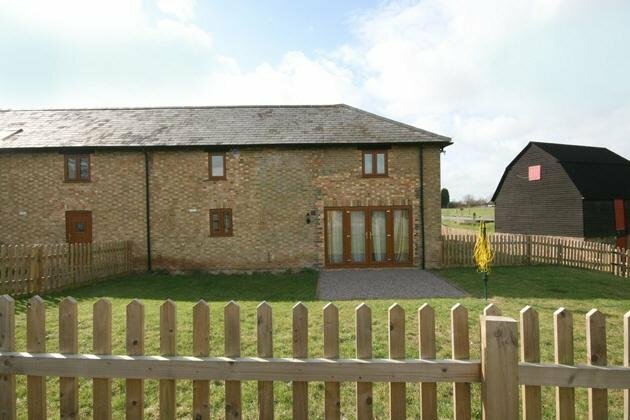 The Dryer Cottage is a lovely, converted barn on Ford End Farm, a working farm at the foot of the Chiltern Hills. Ivinghoe is close to the Ridgeway path, the Grand Union Canal and about ten minutes to Tring Station, which has rail links to London in 50 minutes. There is a watermill and fishing lake on site, under different ownership. The Dryer Cottage is a two storey property, with three bedrooms. The kitchen/diner is fully equipped with cooker, fridge, freezer microwave and washer/dryer,(no dishwasher) and has a dining table which comfortably seats six. The lounge are has two large sofas, and a televison with Freeview and DVD player. There is also a downstairs shower room and toilet. Upstairs the master bedroom has a King-size bed which can convert to a pair of twins, wardrobe and chest of drawers. There is a twin bedroom (which can convert to a king) with a chest of drawers, a single bedroom with a chest of drawers, and a family bathroom. Ample parking is available for tenants use. £30 worth of electricity is included in the rental for this property. Electricity cards are available to purchase if more electricity is required. Heating by electric radiators. The cottage has an enclosed garden. There is a fishing lake on site, and arrangements can be made to use this. there is also a Watermill on site, Ford End Watermill. This little mill, recorded in 1616 but certainly very much older, was in use until 1963. Restored by volunteers, and now maintained and run by Ford End Watermill Society, it is the only remaining working watermill in Buckinghamshire with original machinery. It retains all the atmosphere of a small farm mill of the late 1800`s. An unusual feature is the sheepwash in the tailrace below the mill. Washing made the fleece easier to shear and increased its value. This Cottage has 3 bedrooms, 2 bathrooms and sleeps 5. It’s been listed on Holiday Lettings since 15 Jun 2017. Located in Aylesbury Vale, the average weekly rate is £745.